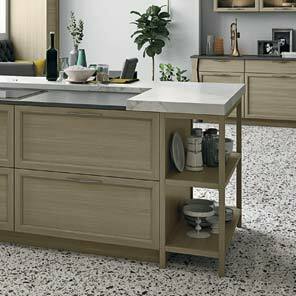 Vogue is a contemporary classical kitchen, with framed fronts in wood or lacquered MDF, featuring thin frames with handles or push-pull mechanisms. 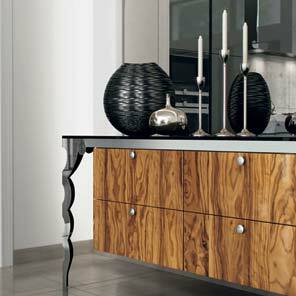 Vogue privileges rich materials, solid wood open shelving, refined consoles and credenzas. 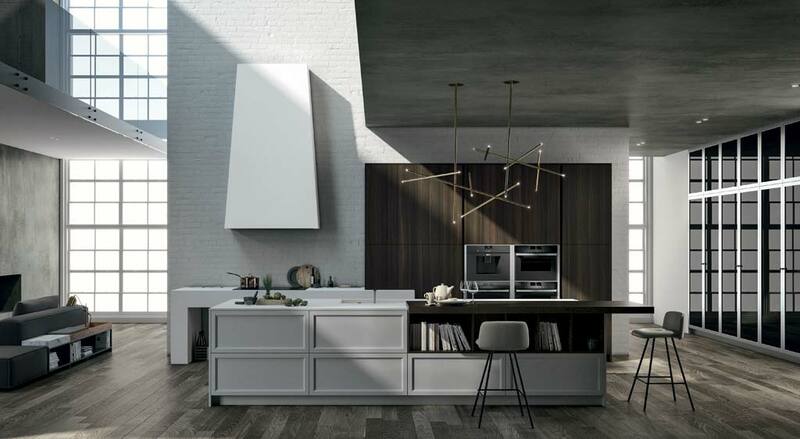 The Contemporary version flaunts elegant and linear geometries, enriched by planes of volumes of differing depths; the Luxury version boasts rich, sophisticated and discernible details. 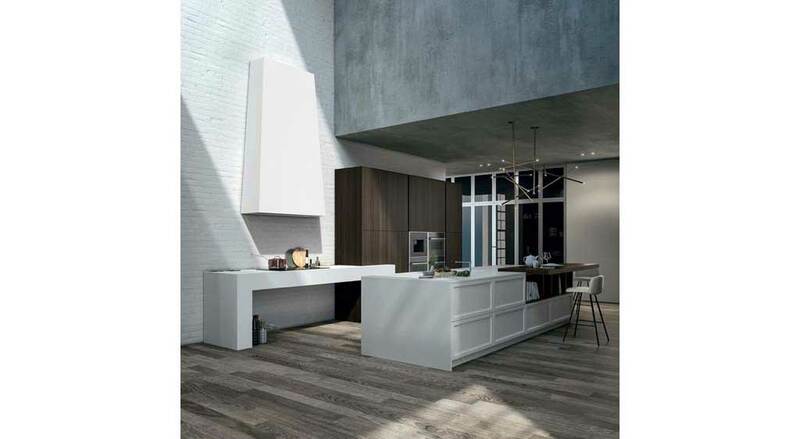 This U shaped peninsula version of Vogue Contemporary is enriched by a work surface in Corian®, mixing tradition and modernity. 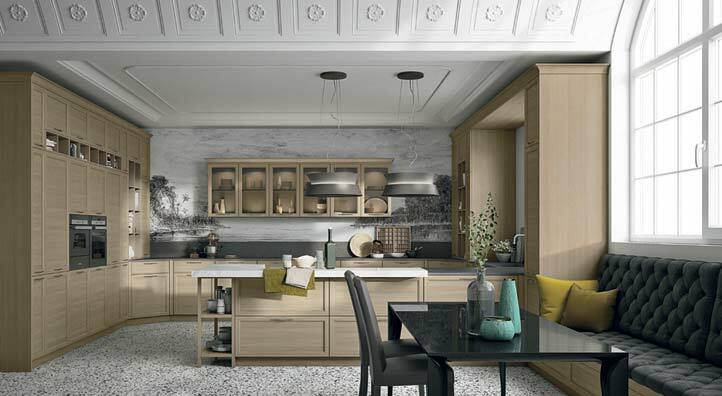 Open shelving introduces movement to this broad and spacious composition, enhanced by upper and tall pantry cabinets with traditional framed fronts in oak or transparent bronze glass. Upper and tall cabinets are linked by a cornice bridging the window opening below. 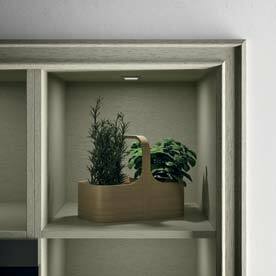 The peninsula terminates with an open shelving unit in solid Zolfo oak. 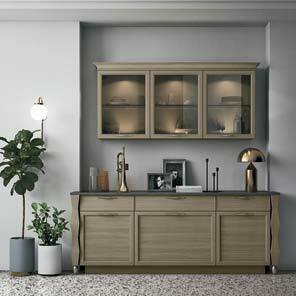 Vogue’s modular elements can be used to create this credenza with shaped legs and polished stainless steel feet. The contemporary classical style of Vogue is evident in a selection of decorations. 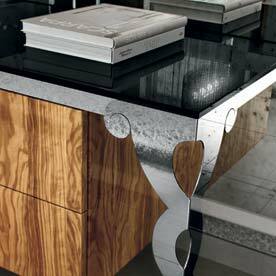 Sophisticated and inspired by the past, they include curls embellishing upper cabinets and shaped legs for tables and consoles. Polished stainless steel brings a touch of the modern to often simple details, like these oval feet. 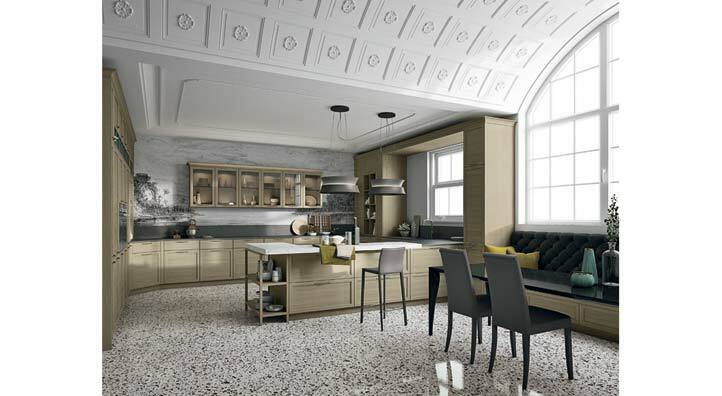 The traditional cornices of classical kitchens receive a contemporary makeover with Vogue, thanks to selected forms and finishes. 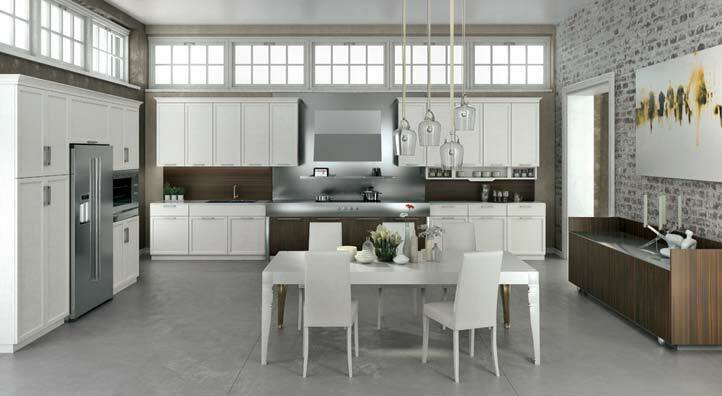 They embrace and in some cases exalt upper and tall cabinets and open shelving, small or large, or large enough to become bookshelves in the dining area. 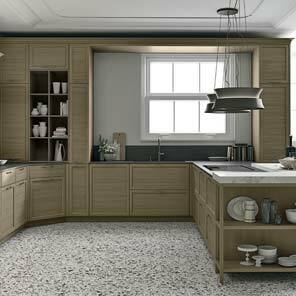 Vogue solid wood open shelving is the ideal completion to an island, peninsula or linear kitchen, enriched by a central frieze. Whatever the choice, they open up views and introduce practical ways to ensure that everyday objects are always close by. 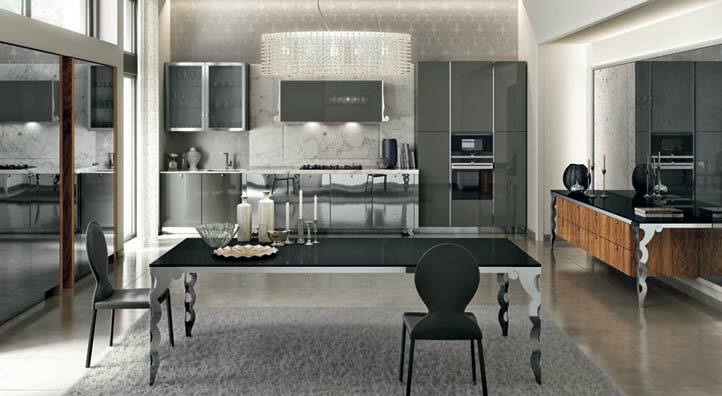 Vogue’s modern luxury is all about the pleasure of elegant ostentation: a table and console with decorated legs and exclusive polished glass tops, etched mirror finish stainless steel fronts, work surfaces in Carrara marble for the cooking area, deeper than the adjacent base and tall cabinets. 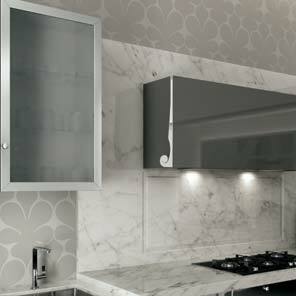 The 150 cm wide wall unit for the built-in exhaust hood features a top hinged front and decorative polished stainless steel curl. Suspended drawers in polished olive with steel and glass pommels, a glass top and polished stainless steel frame and legs. 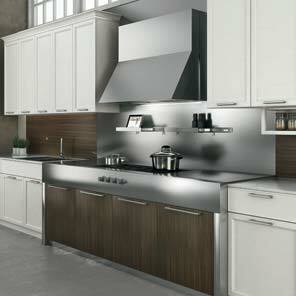 Mirror finish etched stainless steel fronts with steel pommels, embellished by a glass centre. 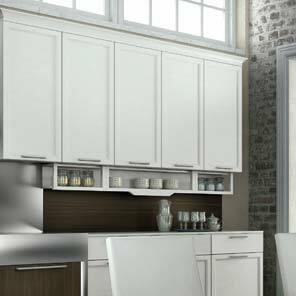 Vogue Contemporary: eucalyptus wood and stainless steel bring a modern touch to framed fronts. 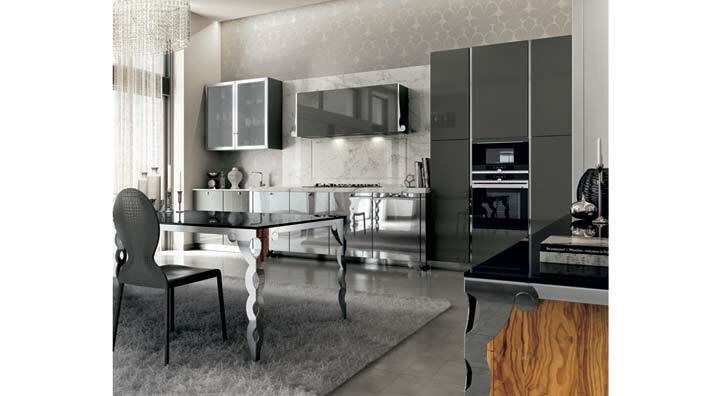 A linear configuration with tall pantry cabinets is divided and fitted with 90 cm wide appliances. 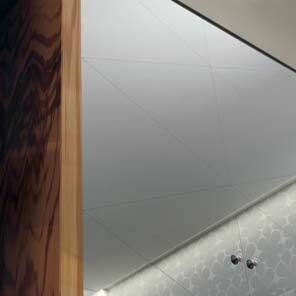 The composition is completed by a contemporary linear console. 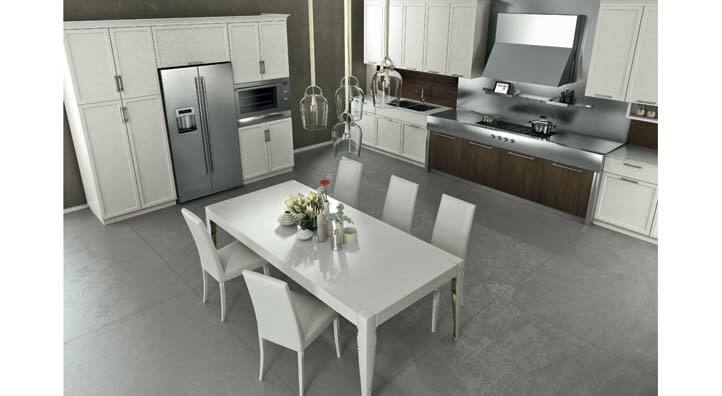 A thick and deep volume finished in stainless steel with front mounted controls and eucalyptus fronts defines the cooking area. 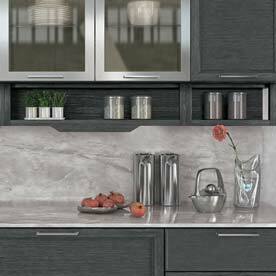 Three solid wood open shelving modules below the wall units are completed by a central décor. 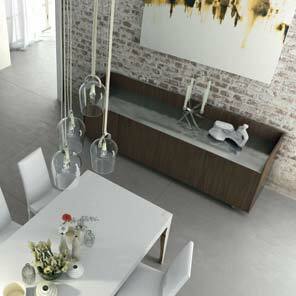 A contemporary console for the dining area in eucalyptus with a thin worktop and stainless steel oval feet.